No, really, honestly, the fact that it’s on the Internet doesn’t mean you can copy it. As genealogists, we also have our own individual intellectual property rights — our own copyrights in our own work (in our writing and in the photos we take) — that we can and should protect as well. Think, for example, of archives of published articles such as those recently posted by Elizabeth Shown Mills on her wonderful new website Historic Pathways. Think about the careful proof arguments that we work on and write up and post for others to learn from and comment on. And think about things like photographs we take to illustrate our research — or even just for our own enjoyment. So what does my copyright mean? Pure and simple, I have the exclusive right to say what can and can’t be done with that photograph. There are exceptions, with the big one being fair use.5 Trust me on this one: snagging 100% of somebody else’s photo for your own website or web account ain’t fair use. And so where did the dude go wrong? Ah, let me count the ways. First, he didn’t get my permission to use the image. In fact, what he was asking for wasn’t permission. It was forgiveness. He had already taken the image without asking, changed it to suit his preferences, and posted it (turns out not only on Facebook but on his Twitter page as well). Third, he assumed that my “sharing” the picture on my personal blog was also “sharing” the right to use it. Nope. Remember: the image is mine. I can use it. But nobody else can unless I say so. Fourth, he assumed that because he said where he got the picture, he wasn’t violating my copyright. Nope again. All he did by saying where he got it was not pass it off as his own work. Saying “I copied this from you” is still copying it, and that violates the rights of the copyright holder. And sixth, I must confess, he annoyed me. He didn’t ask for permission in advance, he changed the image (hey! what was wrong with it as it was, darn it?) and he got snotty when I said he couldn’t use it. (Asking “did you ask the eagle for permission before you photographed it?” is not the way to win friends and influence people.) I had to threaten to get Facebook involved to get him to remove the image from his pages. All that being said, I do appreciate the fact that he asked at all. But I was and am uncomfortable in having my work (and my name) associated with people I don’t know and whose personal, political, moral or other positions may well be antithetical to my own. Taking a hard line on copyright isn’t an easy position for a genealogist to take. As a group, we are and we should be sharers. But there’s a difference between sharing facts (which, by the way, can’t be copyrighted anyway8) and having what we’ve done stolen. When we do important work of our own, we have the right to keep control of that work, and it’s important to draw the line and say no. So… got that, dude? Next time, go take your own pictures. No hestitation here to protect my copyrighted material! A theft is a theft. Thanks for the great article. I appreciate your comments, Bill. I think most of us just forget we have our own rights too! Nice, straightforward and succinct article…much clearer than other explanations I’ve seen. I suppose you can’t blame the annoying dude for trying, though…it’s a FANTASTIC photo! Great article. I have wondered how to handle photos, of family, that I have shared only to see them presented as “shared” as the presenter’s own. You’re welcome. But your question raises another point — about photos we own, as opposed to photos we personally took. The rules are NOT the same. I’m adding that to the queue! Such a great answer – and of course, a very tiny thanks to the DUDE who presented you with a fait accompli and thought it was ok – thus starting this article in the first place. Photos are particularly likely to be taken blithely by others and presented as theirs. Sigh. A definite challenge. I’m now waiting for the next article on “photos we own, as opposed to photos we personally took.” Thanks for your enlightening article. Thanks for the kind words, Celia. And yes, swiping images does seem to be the norm, doesn’t it? I am in the process of building my site, and am also curious about copyright. Images I took are a no brainer, but what about historical photos and documents that I’ve inherited and have digitized? If I was to do a visible watermark and/or put info in the metadata, would I use my own name, or the name of my site (which may or may not be my future company name)? Or would it be different depending upon the creator? I see your own site copyright is “The Legal Genealogist” and not your name. Thanks for the informative article. Look for a blog report on this extended copyright issue within the next week to 10 days, Dawn! Is your third profession photography? It’s a fabulous photograph! It seems obvious to me, not a person with much legal background, that what the facebook used did broke copyright laws. But what about pinterest? 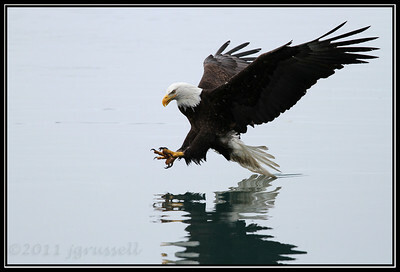 When someone links an image of your eagle to one of their pinboards is that copyright infringement? Thanks for the kind words, Nancy. Photography is pure hobby for me — what I do for fun. As for Pinterest… I have to tell you, I wouldn’t be on that site for anything. I’m not convinced it isn’t a massive copyright suit waiting to happen. If you want to see why I won’t go on there, you might read this blog post by another lawyer-photographer. That blog post was the one that prompted me to ask you about Pinterest! Thank you for your opinion, Judy. I appreciate it. I looked at some of your other photos. They are fabulous! I love the little bird in your header. I absolutely agree with the blog post. Granted most people don’t care when you “pin” something. A company selling something would be delighted. What gets me there (and anywhere that has the same terms, such as most photo contests) is the notion that you give Pinterest an unrestricted license to do what they want with YOUR stuff. Uh uh. Not me. No way. Thanks for the compliment on the photos. I do enjoy it. The bird in the header is a lilac breasted roller photographed in Botswana in 2008. Fabulous fabulous amazing trip of a lifetime. A great and much needed article on an important subject. How about a follow-up with some real world guidance as to what actual steps one can take to “protect” their copyrights? A good idea, and will do.